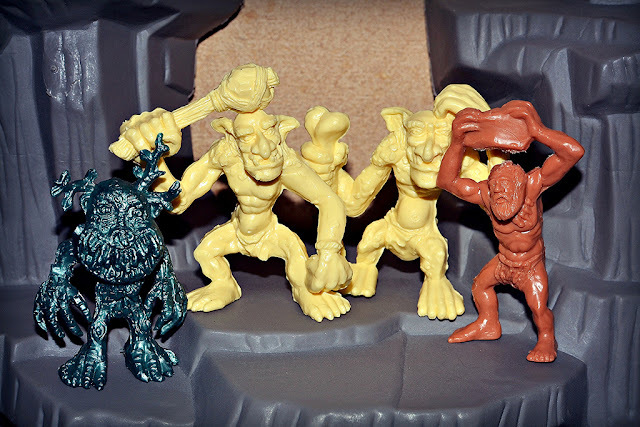 Little Weirdos: Mini figures and other monster toys: Oritet Russian fantasy figures: Cave Trolls and more! Oritet Russian fantasy figures: Cave Trolls and more! A couple years ago I posted about an awesome set of mini figures based on creatures from Russian folklore. They were released in Russia in the early 2000s by a now defunct company called Oritet. That set is my favorite Oritet release, but the company did put out a some other gems around the same time, so I thought I'd do a post showcasing a few additional Oritet goodies I own. First up is a group of Russian trolls. Nope, not Russian internet trolls, but trolls of the old-fashioned cave variety -- as pictured above. As trolls go, these are pretty top-shelf. From their huge heads to their bumpy skin and pot-bellies, these figures have a lot of personality. They are made of the same type of material as the folklore figures -- a hard, sturdy plastic. They measure about 2.5 to 3 inches tall. My set is in a cream color, and I've seen photos of some in glow-in-the-dark white, too. I'm not sure if they came in any additional colors. 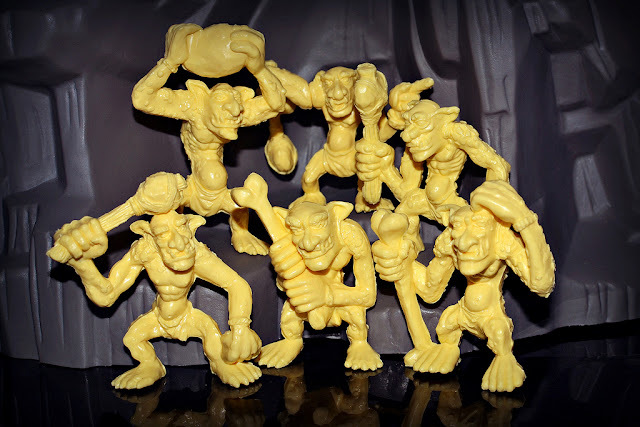 You can see the GITD set as well as the box artwork for these guys (plus tons of other Oritet figures) over at the Fantasy Toy Soldiers blog. Here's a comparison shot showing a couple of the trolls alongside one of the Oritet folklore creatures as well as a caveman from their Cavemen set. 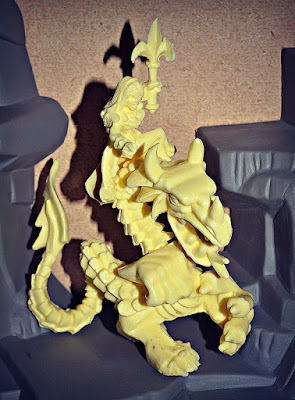 The other Oritet piece in my collection is a dragon with a removable sorceress rider. By itself, the dragon is about 3.5 inches tall. 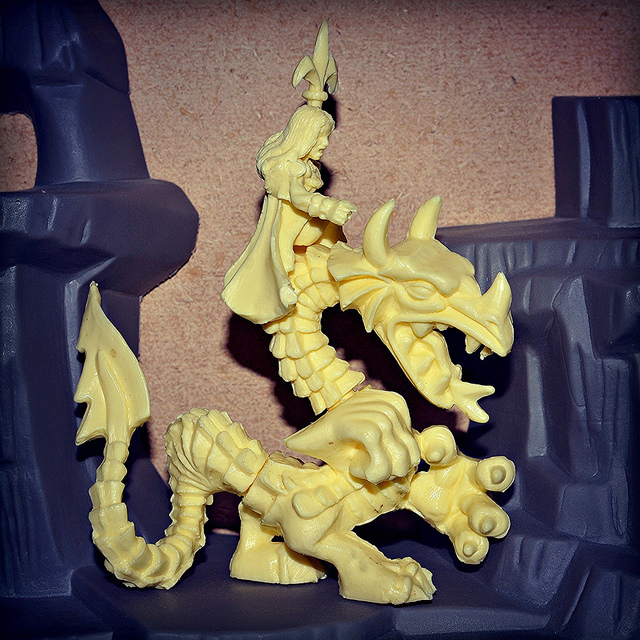 With the sorceress attached, the piece is a little over 5 inches tall. In addition to the rider being removable, the dragon features articulation at the neck and tail. I really like the bold, stylized design of this beast, and of Oritet figures in general. I think it would look even cooler in a more interesting color, but maybe some of these figures were intended to be painted. Having been exclusive to Russia, these Oritet toys aren't the easiest to find, but they do turn up for sale from time to time. They are fantastic figures that deserve more attention. As mentioned above, be sure to go check out more of them at the Fantasy Toy Soldiers site! Nice post Frank. I have been told that these guys are hard to find even in Russia. Thanks Shaun. Your site is how I first became aware of Oritet figures. Hi these were first made by/as Technolog (Технолог) Amazons http://thingsofplastic.blogspot.com/2013/08/technolog-amazons.html. Great blog BTW! I don't think that is correct. Oritet and Tehnolog are separate companies.